Shockoe Bottom&apos;s newest attraction is Boom Boom Burgers, where the Mrs. Boom has Colby cheese, house-made ketchup and pickles on grass-fed beef. Grass-fed burgers and seasonal sides are Josh Eftekhari&apos;s answer to the healthy-food business model. For Boom Boom Burger, he&apos;s buying ingredients from renowned Polyface Farms to serve nutritionally dense foods in a fun, progressive and social-media-driven environment. The first location in what Eftekhari intends to become a franchise (he says multiunit concept) is in the former PapaNingo spot at 1703 E. Franklin St. in Shockoe Bottom. House-made condiments, local mushrooms and cheeses, and Polyface bacon and eggs for the happy pig and clucker options, give the small menu personality. The Mrs. Boom burger has Colby cheese, house-made ketchup and pickles for $7.50; the BBQ Boom with Gouda, bacon and house barbecue sauce runs $10. Seating at red stools around the perimeter and two communal tables in the center handle about 30 customers, and business has started strong thanks to tweets, fans and videos explaining the Boom Boom mission. Grass-fed beef is trickier to cook, Eftekhari says, “much different than grain-fed beef. It can go from cooked through and juicy to overcooked in 30 seconds.” He&apos;s teaching kitchen skills to a young staff while flipping quite a few burgers himself — a long way from his previous job with Dominion Resources. “I feel very proud that we&apos;ve hired young people and they&apos;ve learned how to cook something of quality, handling this carefully,” he says. “What we&apos;re doing is what a lot of people have wanted.” He&apos;s looking at a Virginia Commonwealth University location and Charlottesville for potential offshoots. Open 11 a.m.-9 p.m. Tuesdays through Saturdays. No cash. http://www.boom-booms.com. Greg Haley&apos;s running on adrenaline while Amuse, the fine-dining restaurant at the Virginia Museum of Fine Arts, gears up for the biggest exhibition ever and hordes of hungry patrons. As parts of Picasso&apos;s personal collection open their four-month run, chef Haley and the culinary team will feed 700 guests at a gala, a series of preview functions and a full house of reserved seats for the foreseeable future. Lunch will last an extra hour, until 3:30 p.m., and small plates and cocktails are available until closing. Dinner hours continue on Thursdays and Fridays. This is proving time for the museum&apos;s retooled food-service areas, with potential for a serious payoff. Amuse will unveil a new round of seasonal menu items, focusing on Spanish and French dishes to summon the painter&apos;s palate — an example is grilled salmon served on lamb sausage, chickpea and spinach stew. New signature red and white VMFA wines, blended by Michael Shaps of Charlottesville, already are being poured. Visitors will see other odes to Picasso within a tourist-friendly radius of the museum. At Six Burner, co-owner Beth Marchant will display her Picasso-inspired ink, charcoal and pastel pieces throughout the restaurant (http://www.sixburner.net). Strawberry Street CafAc is offering a 10 percent discount when customers show their Picasso ticket stubs (http://www.strawberrystcafe.com). Jaks Bagels Sandwiches, bagels, sweets and coffees in new Carytown shop. Breakfast and lunch daily. 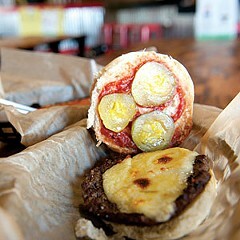 3443 W. Cary St. 447-2146. http://www.jaksbagels.com. Cupertino&apos;s New York Bagels and Deli New downtown location for breakfast and lunch sandwiches, bagels and spreads. Weekdays 7 a.m.-2 p.m. 1215 E. Main St. 788-1111. http://www.cupertinobagel.com. Surf&apos;s out: The Midlothian branch of Outer Banks Seafood Company closed last week, after eight months in business in the former Bottega Bistro spot. The seafood chain&apos;s Virginia Beach location remains open. When it comes to salami, salt meets earth at the Richmond-based Olli Salumeria. The names and recipes go back hundreds of years: Molisana, Norcino, Napoli and Calabrese, all slow-cured salame from Olli Salumeria, based in Richmond. While Oliviero Colmignoli carves ribbons from the first Olli prosciutto — salted on Dec. 4, 2009, and “just pulled out of the rack yesterday” — he keeps his pride muted and his knife in gentle motion. This prosciutto melts into a silky tang that&apos;s almost effervescent; it&apos;s deemed a success worth waiting for, and Olli Salumeria has another selling point. The local business is named for Colmignoli, a cap-wearing Italian with a young family and a fourth-generation calling. He and founder Chip Vosmik consider their Mechanicsville production space a test facility to be strategically outgrown. Imported equipment, high-tech parchment packaging and meticulously engraved red business cards show buyers these guys are tasteful, serious and ready to move artisanship to an industrial scale. So far, larger markets are most responsive to Olli&apos;s launch. At the Fancy Food Show in San Francisco last month, Vosmik says “it was three days of us not stopping once, of ‘How many do you want?&apos;” In New York, some A-list chefs are tasting and buying, well aware of charcuterie&apos;s comeback and consumer desire for carefully made organic products. “Salami in the United States is where California wine was in the &apos;70s,” Vosmik says, meaning opportunity has arrived and the movement still has momentum. In Richmond, Olli cured meats are sold at Libbie Market, Belmont Butchery and Secco Wine Bar, as well as Feast in Charlottesville, the Inn at Little Washington and Palladio at Barboursville Vineyards — “anywhere our quality is appreciated,” Colmignoli says. 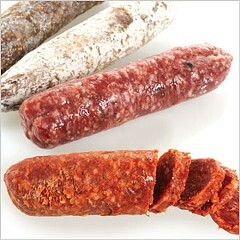 http://www.ollisalumeria.com. The Blue Goat: In case you missed it on styleweekly.com&apos;s Short Order blog, a new restaurant is in the works next to the Westhampton Theater. Chris Tsui and his Osaka group will open the Blue Goat at 5710 Grove Ave. later this year. Chef Kevin LaCivita (Pomegranate, Sushi-O) will oversee a European-influenced menu. “This is a very different concept for us,” says the group&apos;s general manager, Ren Mefford, “and not fine dining. We&apos;re always trying to do something that sets us apart.” Tsui&apos;s design consciousness already is making its mark on the 1940s building, the largest yet for the group. The White Anchovy: About to be finalized is a new venture for Todd Manley of Pescados. He&apos;ll take over the space left behind when the Trak family closed Seafire Grill near Short Pump. Look for a Mediterranean menu on the blackboard, a casual staff and a familiar chef as the deal comes together. “It&apos;s a nice time to be an independent guy in Richmond,” Manley says of the sweetheart deals going out to some of the city&apos;s busiest chefs and owners. They&apos;re getting calls from all kinds of landlords and developers, hoping new restaurants can draw business to their underperforming real estate. Watch this space for updates. Nine North Fourth: Our love wasn&apos;t enough. Chef Phil Barradell has closed the downtown cafe he opened last year. Boom Boom Burgers opens with a social media blast. A delivery guy from Polyface Farms dropped off bacon, eggs and grass-fed beef at Boom Boom Burgers today, signaling a savvy new player in edible Richmond. The burger joint at 1703 E. Franklin St. in the former PapaNingo spot, is the first in what owner-founder Josh Eftekhari hopes will become an urban trend. “We want to show that a local food system is commercially viable,” he says — not just buzz words but in practice. Boom Boom opened yesterday and promptly filled with customers thanks to Eftekhari&apos;s tweets, Facebook updates and YouTube videos, highlighting what&apos;s different about the business. “We want to serve nutritionally dense foods and we want to use social media to do that,” the former corporate professional says. “I think consumers are making decisions more based on ingredients now,” which means he&apos;s working with small farmers for goods to make his own ketchup and aioli, and to supply mushrooms, sweet potatoes and cheeses, in addition to the Polyface goods. Burgers include the Mrs. Boom (Colby, ketchup and pickles for $7.50), the classic, which adds grilled onions and Boom sauce; and meat-free cheese melts for $5 and $6. The business serves Tuesdays through Saturdays from 11 a.m. with more evening hours starting next week. Read Style for more details about this business, which is designed to grow into a multi-unit concept with sights on VCU and Charlottesville. 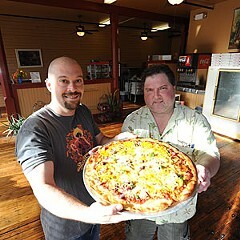 Richmond&apos;s seemingly insatiable appetite for pizza gets a new option — the Paul Bunyan, shown off by Victor Wine and Bob Buffington at their new Church Hill cafe. It doesn&apos;t even have tables yet, but Church Hill&apos;s newest restaurant, Buffington & Wine&apos;s Pie, Fries and Franks, is up and running. Haute cuisine this ain&apos;t. With chocolate-drizzled fried Twinkies on the menu, it&apos;s only fitting that outsized hospitality in the form of co-owner Victor Wine makes the place anything but stuffy. Sited on one of the hill&apos;s few retail corners at 2824 E. Broad St., the revived 1890s market is sun-drenched and bustling. Furniture arrives any day now, and until then customers are carrying out the foot-long deputy dog; the fatty, a quarter-pound marinated bratwurst; and pizzas such as the kumoniwannaeatya (mesquite-grilled chicken, jalapenos, pineapple, purple onion, chipotle-citrus-barbecue sauce, sharp cheddar and mozzarella) and the Jackie O (white margherita pie with fresh pesto and cheeses). Black-and-tan-battered onion rings, skin-on fries and “mickles and muckles” make the menu read like a theme park&apos;s worth of high-cal options, cooked to order in the open kitchen. By day, B&W&apos;s has the energy of nearby coffee shop Captain Buzzy&apos;s Beanery (whose owner, Bob Buffington, is a partner in this venture). At night, Wine promises a calm atmosphere with music by jazz greats and “an incredible wine selection across the board, in the $8 to $15 a bottle range. “My last name&apos;s Wine — I take it seriously,” he says, “and we&apos;re trying to be good to the neighborhood.” Open daily 11 a.m.-10 p.m. 864-2835. Marathon jam: Nonstop bluegrass music returns to Grandpa Eddie&apos;s Alabama Ribs and Barbecue on Feb. 26 from noon until midnight. It&apos;s a benefit jam for the Richmond Fisher House, which feeds and houses families of veterans being treated at McGuire Veterans Hospital. Organizers, including the band East of Afton, hope to raise $10,000 in their second annual event, which features several bands. For details see gpebbq.com. Hookah bars are ancient news in many parts of the world, and even in Richmond they&apos;ve been popping up for a few years. But the arrival of Shockoe Slip&apos;s newest club, Off the Hookah, has ratcheted up interest in the centuries-old hookah ritual, raising questions for those who haven&apos;t smoked shisha before. Off the Hookah allows hookah smoking at the bar and in the seating areas on the upper floor of its massive, elaborately decorated two-level space. Guests choose from a menu of flavors — $20 for the regular Egyptian tobacco and $25 for organic hydro, a sugar-based, nicotine-free smoke. Flavors run toward the sweet and fruity. Double apple and chocolate mint are big sellers, or guests can blend flavors such as cappuccino and banana. Cigarette smoking isn&apos;t allowed, and although the staff is used to jokes about adding cannabis to the mix, it&apos;s not legal (yet) nor typically part of the hookah bar scenario in this country. The decorative water pipe is fitted with a plastic mouthpiece and brought to the table by a server. Two or three guests can share, and smoke can last an hour or longer. Hookah runners stoke the coal, assist guests and offer refills for $10. It&apos;s all added to the bar tab, and tips are later divided among personnel. Traditional smokers always use their right hand to hold the hose, and never pass the hose directly to another person unless it&apos;s folded so the tip points inward. Manners are somewhat looser at Off the Hookah and other clubs, but a respect for the ritual&apos;s cultural significance is desirable. A dress code (no sneakers, no baggy jeans, no hats) befits the upscale nature of the club, which has packed in more than a thousand partiers on recent weekend nights. “Hookah is definitely a very social thing,” says the club&apos;s self-described hookah general, Trevor Fletcher, “and I do think Richmond will catch on. This place is remarkable, it&apos;s good quality shisha, and when the weather is warmer we&apos;ll have outdoor hookahs” in the canal-side setting. Hookah smoke doesn&apos;t leave the club or its guests smelling like cigarettes, but nonsmokers can drink and dine downstairs away from it all. Unlike some clubs, food isn&apos;t an afterthought for this business. Middle Eastern and Mediterranean recipes are prepared by a 30-year kitchen veteran, chef Ed Blase (pronounced blaze), formerly of the Edible Garden. Desserts are his specialty: Baklava, chocolate ganache torte, fried cheesecake and carrot cake are on a changing list of indulgences. On the lunch menu, hamburgers on Flour Garden buns, Caesar salads and steak kebabs are popular; at dinner, the house platter (hummus, baba ghanouj, grape leaves, falafel and fattoush salad) is meant to be shared, generously portioned at $16. Small plates are under $10, including gyros, coconut shrimp, chicken wings with Asian glaze and seaweed salad; a changing list of entrees in the $15 range offers meats, pastas and seafood. Off the Hookah is at 140 Virginia St. in the Hat Factory building, serving weekday lunch with dinner and bar hours nightly except Sundays. offthehookah.com.